As you all know, I work for Lehman Brothers. And I’m pretty sure by now, you all have heard that the company filled for Bankruptcy earlier this week. I have worked at Lehman for my entire professional career. Starting as a lowly summer intern in June 1998. Working my way up to a part-time hourly employee during my undergraduate studies at Polytechnic University, starting in May 1999. And finally being hired as a full time employee in May 2001. I have been employed at Lehman uninterrupted since May 1999. Lehman has been more than a place where I go to work everyday. It is a place were I have made many friends on the professional level, and some of those relationships have grown beyond the office. My three managers I have had since I started working at Lehman all attended Paula and my wedding back in 2005, and I have attended their weddings, Christmas parties at their homes, and even Chinese New Year celebrations. I knew it would always be hard to finally say goodbye when the time came for me to leave this chapter of my life behind. At this point, it looks like me and along with probably a good 95% of the rest of the firms employees will be forced to leave before most of us were ready to. What’s worse is that there are many people who have spend the bulk of their professional careers at Lehman and as they are approaching retirement, they are in bad shape and I ask each of you to keep them in your prays. Lehman was the last bank on Wall Street to have a pension plan, which most of the long time employees are depending on for a significant portion of their retirement incomes. I know many individuals from my department who have been affected in this way. As of today, we still do not know what will happen with the pensions, so please let’s all hope and pray for the best. Us, younger employees will be ok, but those old-timers will really be feeling the pain regarding this issue in particular! The Lehman Brothers culture, good or bad, was one of Pride and Family. There was a sense that we are all in this thing together and that we are all contributing to making the firm a direct competitor to the likes of Goldman Sachs. When I first started at Lehman, people told me, “Why are you joining that company!” “Come on Rob, you can do better than Lehman.” In fact no one besides myself, from my graduating class from Poly joined Lehman (although some did have offers and some were even interns along with me), They all thought they could do better. The funny thing was, they all changed their tune after a few short months. Most of them lost their jobs do to the slowing economy and 9-11. Lehman although displaced from it’s global headquarters (World Financial Center – Tower 3 / The American Express Tower) which was heavily damaged during the terrorist attacks, was committed to rebuilding a strong firm than ever. They soon succeeded; we purchased a new Headquarters in midtown Manhattan, just north of Times Square, 745 7th Ave. We got a new building in Jersey City to replace our outdated and overcrowded 101 Hudson IT and Operations Jersey City building. We began expanding both domestically and internationally. Every week we would receive multiple internal communications on new acquisitions and deals being made across the global. They started rebranding the company, and we went from logos that were just gold letter of the words “Lehman Brothers” on a plain and solid dark green back drop to “Lehman Brothers – Where Vision Gets Built…” flashing on full color, jumbo screens on the sides of the new 745 building in Times Square. Each of our regional headquarters in both London and Tokyo were also being upgraded. A few short years after 9-11 which everyone predicted would be the end for Lehman, we purchased the Asset Manager Neuberger Berman. This marked a turning point in Lehman’s history. We started to risk among the ranks of the Wall Street Power Houses, and instead of being comparing to companies like Bear Stearns, we were being compared up against Goldman and Morgan Stanley. When I would visit Paula up at Syracuse University when she was studying for her MBA, her classmates would approach me asking how is it to work at Lehman. That is the company they want to work for. Could I give them any tips on how to get their resume in front of the right people to be hired by the firm. And it wasn’t limited to Syracuse and a bunch of young and hungry MBA students. Everywhere I went, when someone heard I worked for Lehman, they wanted to speak with me about the company and if I would mind taking a look at their resume. I was so proud to work for Lehman. In just a couple of years, it went from a company of only 7000 employees worldwide to over 25,000. It went from the company where people told me is run as far away from as possible, to the company where everyone wanted to work for. Lehman was known for treating their people right. Salaries were definitely comparable to the rest of the industry. Bonuses were great. Year End Parties were fun with Town Cars for each employee to go home in. The flexibility to work from home when needed was amazing and will truly be missed. Departments so long as they were “successful” were given many perks. My department for example always had up to date Computers and dual 19in flat panel monitors for just about everyone. Office Supplies were readily available in draws in front of the department admins. Free lunches at all large or long meetings. And we even went on a boat trip on a chartered NY Waterway Ferry with free beer and wine last year as a “team building” trip for the entire department. Training classes both technical and soft skills were made available to ALL employees freely. These classes would cost anywhere between $1500-3000 for a single day course to $5000-7000 for a five day training class. You potentially could have taken as many of these courses as you wanted to, so long as your direct manager approved. Being a manager myself, I have never seen an employee abuse the privilege and I always approved all request for these courses. If you could find a PC that wasn’t in use, in most cases the company and your managers would allow you to take it one along with Flat Panel Monitors to help with night support and working from home! I feel that I have taken many steps in this process, but now with the stress and due to the “unknown” with the Lehman situation I definitely feel like I have take a few steps back. I am extremely saddened by the down fall of Lehman. I feel like it is the end of an era. I have given Lehman so much, but they have also given back to me so much, in a world that depends upon money. I can’t imaging a world without Lehman. I did not know if I would be at Lehman for my entire career and in fact, I felt that most probably I would not be. However, I thought, I might eventually return to Lehman as so many employees who have worked for the company do, and possibly retire there. It literally brings tears to my eyes to think that this is no long an option. To think about walking by 745 7th ave, and reminiscing about all the meetings and presentations I gave there to Managing Directors for the Trader Portal project. To remember the feeling of pride as I walked through the doors of the building of my company; a company that was 30-33% owned by the employees. Hey! Managers! Leave them Programmers alone! For you non-Java Programmers out there, here’s some definitions for ya! So to sum it up: Programmers write Code or “Source Code” in Cubicles, that Source Code is organized into Classes, and in Java, lots of classes are stored within a JAR File. Programmers do not like Project Management, and Project Managers like to make sarcastic remarks about programmers codes when standing above them in their Cubicles, while reminding them that all their source code changes better be in the Source Control System such as SVN or CVS! It’s pretty simple. 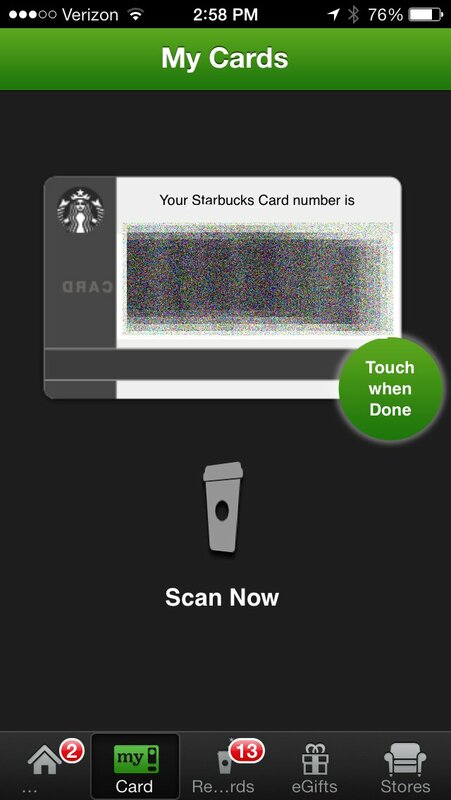 Since the Bar Code is just a representation of your gift cards Serial Number, all you need to do is take a Screen Capture from your phone of the generated Starbucks Card Bar Code. Then you can email it to your wife/husband/boyfriend/girlfriend, or whoever else you want to use your card. PLEASE NOTE: This does not fool the system into giving you free Starbucks! Nor was this an attempt to try to circumvent the system. Also, DO NOT Send this to anyone who you do not want to use your Starbucks card and your money, treat this screen capture as if it was your real Starbucks card, because it is! Your balance will decrease each and every time someone scans the photo on their own smart phone at the Starbucks register. Also, what’s cool about this method, is you do not need to share your password, and the person you share the photo with doesn’t even need the Starbucks App installed on their phone! For the last 8 years that I have been giving my architects, tech leads, and developers their yearly performance reviews, I have been using the acronym “SFEMS”. Arguably you can say I should just be telling my architects and maybe tech leads that they need to design and ensure their team’s implementations follow the SFEMS (Stable, Flexible, Extensible, Maintainable, Scalable) mantra. with SFEMS always on their minds. Everyone in my group is required to ensure they design and write code that meets this the SFEMS Standards. I don’t care how junior a developer is, we preach it to them from their first day on the job, even if they are just one day out of school. When I have my town halls and other group meetings, I always remind my developers that the expectation is Quality over Quantity (in terms of how much code they can write in any given day), and that refactoring their code to ensure it meets SFEMS standards is the norm. It doesn’t matter how small or large of a component a developer or team of developers are writing, it is always important that the code is first of all STABLE – that is the code should be as close to bullet proof as possible; although I make it understood that everyone and anyone can write code that contains a bug or two. Code should be expected to be used in a one off API where the objects containing your code is used once than discarded or the same classes could be used in a Daemon process where the objects may live for hours or even days to weeks without the process being restarted. This is where unstable code usually becomes a problem because it may work by contain a memory leak or a database connection leak, or other resource utilization issue, and it is why the same code may work if it’s only used once in a while in a process and it causes weird behavior or even crashes in long running processes, or short running processes that use the same code in a loop with thousands or even millions of iterations. Second and Third, their code needs to be Flexible and Extensible. You may say, well what’s the difference? Well to me, code can make an application be flexible if it can be helps the broader application or system which it is part of work under a range of circumstance. Think of it like a person being flexible in their abilities to handle multiple situations or to be able to come up with solutions and work-around automatically to a problem set within the same knowledge domain. In software this is when for example, I am writing a ETL (Extraction, Transformation, Loading) loader and my code should be able to contend with small variances in the data without failing the overall process. More specifically if the loader code encounters one or two records with incorrect Country Codes, the loader should be able to be configured to have a threshold of corrupt records in the source data while still completing the process if that threshold is not met and perhaps report the error records to the development team automatically via email or some other more complex method such as a error queue processing table. We can configure the threshold to be ZERO or ONE and therefore as soon as any error is encountered with fail out the process. But this is where Flexibility comes into the picture, and the threshold can be dictated to us by the business or users. In terms of Extensibility, I expect all of my programmers to follow good OOP / OOD so that their code can be reused and extended to help us cut down on our time to market. For years I have used the approach of creating an “Internal SDK” (Software Development Kit) at the start of a project when I take over as the manager or architect. We usually create a module in our source code repository called “commons” which contains our groups SDK. It contains all the frameworks, wrappers, and useful utilities that are common across our Middleware, Batch, and Standalone processes. In the case where the User Interface is written in the same language as the rest of the system, the UI is expected to use commons as well. Over the lifetime of the systems I own and develop, we have a process of “Promoting to Commons” as objects and other code become so useful they become “common” within our system, and the code will be refactored and moved from whatever source code repository module it was originally in to the Commons module. We use this same principal for non-object oriented languages or components, such as scripts. Even though common scripting languages we use such as Perl and Python either have the capabilities to create Objects and use OOP concepts or are Object Oriented themselves, most times I find that we treat scripting languages as procedural languages, but this doesn’t mean we can’t have reuse. We enforce the same strategies we do in Java or C#. We always programming forward thinking, so if we feel a subset of functions a script that we write can be useful for future scripts, we create a library of common scripts of functions or objects. So I always tell my team ensure that whenever possible if you even just have a feeling that your code or parts of your code can be useful to someone else, ensure that it written so that it can be reused as much as possible. Or if you notice that you are going to be writing the same thing over again, stop and go back to where you wrote something similar before and refactor the code so that the original becomes reusable two both the original component and the new component, or at least extract the common functions into a base class or utility package. Fourth, we must ensure that whatever we write is Maintainable, and that means maintainable by other developers. I am very straight forward in telling everyone that we write systems to last 20 years at least, no matter if we or others will replace it sooner, the assumption must be at least 2 decades. And therefore we cannot afford to assume the same people will be on the same project to work on the code they personally wrote or helped to write over that long of a period. Therefore we need to put ego aside for the team’s sake and write code that is clean and clear, and simply for other members of the team to read and make enhancements to. As managers, architect, and leads, we need to watch over our developers to ensure they are not writing code that only a small subset of people or only one person can maintain. If we allow this in our system, we are setting ourselves up for failure in the medium to long term. Maintainability encompasses Extensibility and the next and final word in the SFEMS mantra Scalability. For systems to be Extensible and Scalable, they MUST be easily maintainable. Otherwise, they really can’t be considered build to be forward looking and therefore are not easily extensible and possibly not scalable as well, if we can’t change the code within reasonable cost to handle changes to the business, system load, and user requested enhancements. The Fifth and final component to the SFEMS mantra is ensuring the code and systems we develop are Scalable. Writing systems to be scalable is not an easy task. We often write code to solve a specific problem. Perhaps we have to write a middleware which will be used by a front-end that will have only 1000 users today. We can do that, because that’s the requirement and we will buy the hardware we need and architect the system to handle this user load. But how will the system perform if we add another couple of hundred users? How about a thousand more? Will it even allow that may users to be online at the same time? How do we build a system within cost that can scale in the future when we don’t even know what the upper limit will be (if there even is one)? It’s definitely not easy, and building scalable systems is an entire topic all to itself worth many volumes of books and articles. However if we followed the first 4 components of SFEMS (Stable, Flexible, Extensible, Maintainable), our systems should be able to scale if we are given the proper resources to enhance it. In my mind we should always build our systems to expect between 1.5 and 2 times the expected user or data load on the system that the original requirements state. If we can do this, we have already bought us enough time to work on ensure the system is Stable, Flexible, and Extensible to scale beyond 2 times the original load. There’s really no way to make a system handle unlimited system loads. Eventually it will come down to a physical limit of the computing platform your code is running on, so we must build systems with Scalability in mind through the first 4 components of the SFEMS mantra so that with the right investment in extending the system to handle the new system loads, we can within reasonable cost models and time to market accomplish the required enhancements. Each of the five components of SFEMS deserve at least a separate post all to their own. However I hope this article will help everyone from junior developers all the way up to senior technology managers on their journey when building large scale enterprise class systems that are expected to write a multi-decade lifespan. I recently participated in a company sponsored people strategy event, where I was part of a panel of leaders at various levels within my department. Unfortunately, we ran overtime and we did not have a chance to answer this question to the forum, so I figured I post my answer here and perhaps even send this link to my teams. Being one for dramatic presentations, I actually brought in my own T-Shirt to the event, to hold up and show, that not only “would I” have a T-shirt that has my catch phrase, I actually DO have a T-Shirt with my “catch phrase” on it, and I wear it regularly. 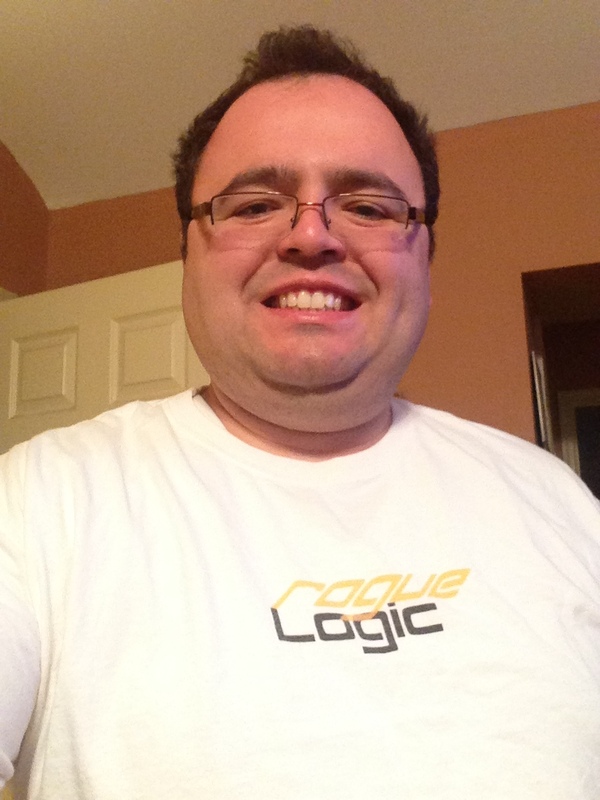 I also have a Polo Shirt with the RogueLogic logo on it! 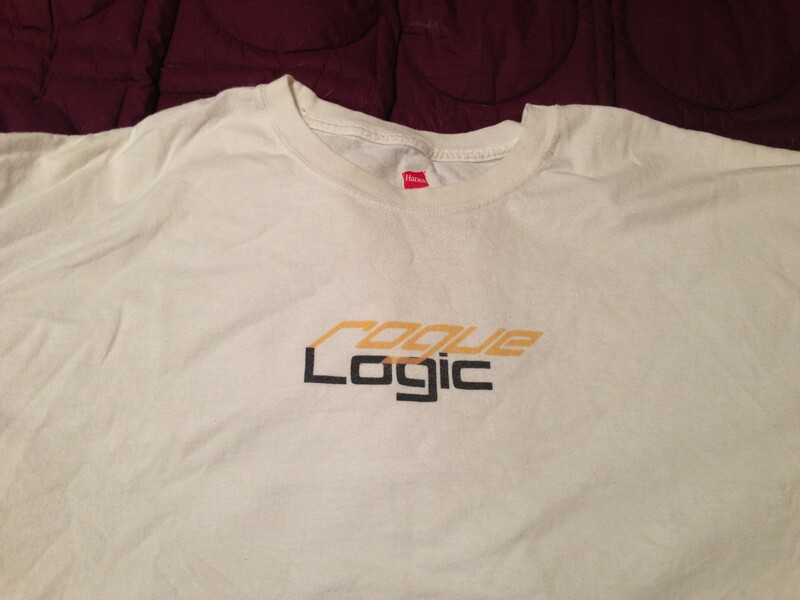 It is a simply white T-Shirt with the RogueLogic Logo on it. RogueLogic as you might already know from reading my Blog, is own my personal web site as well as the web site for the Software Company I tried to start while in College. So what does the “catch phrase” or really the moniker “RogueLogic” really mean? How does this apply to me today in my professional career? And why would I choose to share this at a professional company sponsored discussion panel, that was video conferenced with over 1000 viewers around the globe? Well, because thinking so differently, that it way beyond “thinking outside of the box”, to the point where it’s Mad, Ludacris, any even “Rogue” is exactly how I achieve so much in my professional career in such a short time, and it is what I rely on to get me through the toughest software engineering problems my team and I face on a daily basis. It’s what separates us from the rest of the Wall Street Software Development Pack. 2. This is the second version of the logo. I used this version, when I briefly changed the background color of the website from white to black. 3. This is the current version of the RogueLogic Logo. I originally created this version back in 2001, when I was taking a Web Design Class. Back in 1997, US Robotics had a small banner advertisement on AOL for their 56K X2 modem, which I happened to own at the time, so I took a screen capture and cropped out just the logo. After many searches using Google Image Search, I have yet to find anyone else to has a copy of this Image. Please let it be known that I do not own the Image below nor to I claim any ownership or any other rights to it. Instead I have posted it here for Internet Posterity. Check out US Robotics which as of 2013 still produces 56K modems!